John Dillinger (Depp) served 10 years in an Indiana prison for stealing 50 dollars, he engineered an escape from that prison that cost the life of Walter Dietrich. (James Ruso) After breaking out of jail, he settles in Chicago with Evelyn Franchette (Coutillard) a half French, half Native American woman. He formes his second gang, featuring most notably “Baby Face “Nelson (Stephen Graham) The gang starts robbing banks, until caught in Tucson Arizona and extradited and jailed in Indiana where he promptly stole the car of Sherriff Lillian Holley (Lilly Taylor) Dillinger’s jailbreak frustrates Melvin Purvis, (Bale), the FBI under J Edgar Hoover (Billy Crudup) has put Purvis in charge of catching Dillinger. Purvis asks the FBI for more agents from Oklahoma and Texas. who don’t exactly go by the book. The feds trap Dillinger in The Little Bohemian Lodge, but again Dillinger escapes. Finally, the FBI cultivates an informant, Anna Sage (Branka Katic) who’s a friend of Dillinger’s new girlfriend Polly Hamilton (Leelee Sobieski).Anna tells Purvis that Dillinger will be at the Biograph theater watching a Clark Gable gangster movie. Does the FBI finally kill Dillinger? This movie has been praised by critics for its accuracy. But according to the facts I’ve read, it got at least two facts wrong. The deaths of Baby Face Nelson, and Pretty Boy Floyd did not occur before Dillinger, in fact both outlived Dillinger. Michael Mann gets too caught up in the romance between Dillinger and Franchette. and almost forgets that Dillinger was an infamous bank robber. .I realize that Depp and Cotillard are big stars but does Mann really have to satiate their egos quite that much? The acting is just so-so. is too long, and never does come together as one cohesive movie, it tries to be part romance, part historical drama and part action movie. It fails on all accounts. 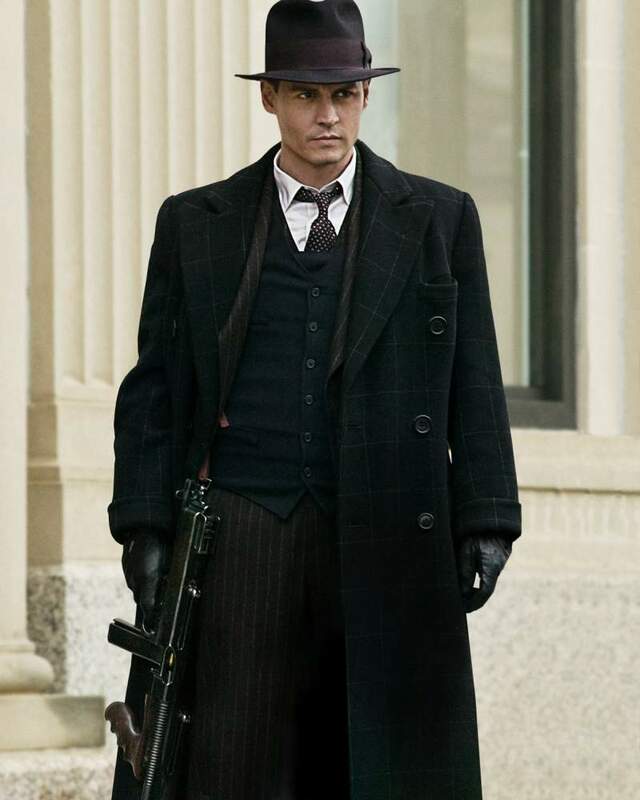 Public Enemies Love your enemies, but hate this movie. Gil Pender (Owen Wilson) is an American writer vacationing in Paris, who is enchanted by the city, but stultified by the modern age. He dreams incessantly of life in a simpler time, his fiancé Inez (Rachel McAdams) is not similarly entranced, she seems to prefer her life in the here and now, and wants her fiancé to go back to being a successful screenwriter. While walking after midnight one night in Paris, he meets F. Scott Fitzgerald, (Tom Hiddleton) his wife Zelda (Allison Pill) and Ernest Hemmingway (Cory Stoll) Hemmingway tells Gil that he should get his manuscript read by Gertrude Stein. (Kathy Bates) In the same night, Gil meets Pablo Picasso (Marcial De Fonzo Bo) and Picasso’s lover Adriana (Marion Courtilard) Once Gil figures out that he’s not hallucinating, and the larger than life personalities appear only after midnight, Gil goes back again and again, and finds himself getting praise for his book, and falling in love with Adriana. Inez and her parents think that Gil is losing his mind, and Inez’ father John (Kurt Fuller) has Gil followed by a private investigator. Does Gil stay in the 1920’s? Or does he go back to being a successful Hollywood screenwriter? I did not like this movie. The premise is gimmicky and amateurish, something I would expect from a young filmmaker. But this is Woody Allen, maker of such movies as Annie Hall and Sleeper, this is a man who knows exactly what he’s doing, which leads me to think that the plot was extremely self-serving. GIl is obviously Allen, in my mind, this is a role he obviously would have played himself in earlier days. Allen would probably love to believe that a manuscript he wrote would be highly regarded by the likes of F. Scott Fitzgerald, or Ernest Hemmingway. And I’m sure Allen would think that he would feel right at home in the golden age of writers and painters, whether he actually would is another story. I also find it interesting that Gil didn’t take his fiancé with him on any of his jaunts back in time, maybe they could have been another F Scott and Zelda, but Allen chose not to go that way. Sometimes, the gimmick lands with a thud, for example, when Gil is talking about the view of Paris from space, or when he gives a Valium to Zelda. The ending is a little too neat and predictable for a plot with so many loose ends. The acting by the leads is sub-par, I’m sick of Owen Wilson, and his California surfer-dude delivery, it seems very much out of place in a character driven piece about contentment. Rachel McAdams comes off as whiny and immature, the supporting actors are much better, especially Marion Courtillard, the supporting actors actually make this movie somewhat engaging. Midnight In Paris: For Whom The Bell Tolls, it tolls for this movie. This is a pointless, mindless, wreck of a movie. It’s hard to imagine that this dreck was co-written by Anthony Mingella, and directed by Rob Marshall who directed the eminently better Chicago. Guido is not a sympathetic character so it’s hard for anyone to feel badly for him. It’s hard for anyone to feel anything for any of the women in this movie, they’re just glamorized strumpets and harlots, conquests for the Great Contini. Why would Penelope Cruz and the formerly great Nicole Kidman and even Judi Dench play such degrading, demeaning roles? It will take me years to wipe the memory of Judi Dench in a camisole from my mind but I will try. The lobotomy begins tonight. Only Coutillard redeems herself as the wronged wife, and even she is forced to do a strip-tease number. And what is with those accents? Guido is supposed to be Italian, but Daniel Day Lewis lets his British accent slip in too often. Courtillard is French, but sounds British , Kidman is Australian, god knows what accent she was doing, and Dench who’s British is trying to do a French accent. Penelope Cruz sounded Spanish, but she always does. This is dialect coach hell. And just when you thought the acting couldn’t get worse, along comes Kate Hudson, and Fergie, Mamma Mia, no wait that was a good musical. Nine fails as a movie, it fails even more as a musical, the songs are not memorable and they are badly sung. Most of the songs are bad because most of them start with the word Guido. Just skip Nine and hope this fine cast learns a lesson from this movie. Just because it’s a hit on Broadway, does not mean it will be a good movie. Nine. More like a 1. Edith Piaf (Marion Cotillard) was born to a mother who thought she could sing. Edith’s mother abandoned young Edith at a brothel run by her grandmother. Edith was raised by a prostitute named Titine. (Emanuelle Seinger) During the time she was taken care of by Titine, Edith lost her eyesight. But Titane prayed to Saint Theresa for Edith, and one day she could see again. Edith believed that she had visions of Saint Theresa. Edith was cruelly taken away from Titine to the circus by her father where she started to sing. After her dad decided to strike out on his own. Edith begins to sing on the sing on the streetcorner and live with a roommate Momone (Sylvie Testud) While singing on the street, Edith was discovered by Louis Leplee , (Gerard Depardieu) who actually gave her the name Piaf (The Little Sparrow) and immediately put her in his nightclub, Le Gerry. But the promise of a singing career could not keep trouble far away, when Leplee was shot, mobster friends of Piaf were suspected, she was charged as an accomplice, but was acquitted. In the 1940’s Piaf became a huge star in France and met the love of her life, boxer Marcel Cerdan, while touring America (Jean Pierre Martins) Cerdan became the middleweight champion of the world, and despite being married with three kids, he started an extramarital affair with Piaf that lasted for a year. Tragedy struck Piaf again, when Cerdan died in a plane crash. She immediately began abusing drugs to ease her pain, but could not. She ultimately died in 1963 of liver cancer, at age 47, after failing at one final comeback the year before. This is an overly long, rags to riches story about a diva named Edith Piaf. She knew she had talent, and so she treated people badly. She never looked for her roommate, Momone, after Momone was kicked out of the apartment they shared,, she begged Cerdan to come see her, even though he had a wife and three kids. Sure she had a rough life, but many entertainers face similar hardships, so I was left to wonder what is so special about Piaf? Coutillard looks a lot like Piaf in this movie, and makes the most of Piaf’s loud, brassy persona. Coutillard’s performance was good, but was it Oscar good? Who knows? I personally think she was better in Inception, but that’s just my opinion. Nobody else really stood out in the movie, other than the women who played Momone and Titine, but they had small roles. The film was non sequential, annoyingly cutting back and forth between Piaf as a young girl, and Piaf as an older woman, there is never a chance to get a clean linear storyline going. That is aggravating especially in a biography. Beth Emhoff (Gweneth Paltrow) is a business executive who contracts a virus in Hong Kong, and unknowingly spreads it throughout Hong Kong and gives it to her son Clark Morrow (Griffin Kane) . 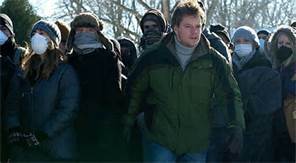 Beth also gives the virus to her lover in Chicago, but her husband Mitch, (Matt Damon) is immune to the virus. Dr. Ellis Cheever (Lawrence Fishburne) is a scientist from the Centers for Disease Control in Atlanta, sends out Dr. Ellen Mears (Kate Winslett) out to investigate the virus in Minnesota, Dr. Mears ultimately catches the virus, and cannot be brought to Atlanta soon enough to save her. Meanwhile Dr. Lenora Orantes (Marion Coutillard) of the World Health is sent to Hong Kong to study the virus from ground zero. Lenora is kidnapped by Li Fai, (Tien You Chui) her translator, to put his village in the front of the line for a vaccine. Dr. Ian Sussman (Elliot Gould) has succeeded in growing the virus, so that Dr Ally Hextall (Jennifer Ehle) can work on a human vaccine. But blogger Alan Krumweide )Jude Law) , a conspiracy theorist, says the government already has a vaccine that cures the virus, and is recommending Forsythia, a homeopathic remedy for the virus. Krumweide is also making a stink about Ellis Cheever getting his girlfriend Aubrey (Sanaa Lathan) out of Chicago before she gets infected. Do the scientists find a vaccine? Does Forsythia work? Contagion: Spread the word, this movie is not that good.